One of the most picturesque aspects of Emerald Village is the Discovery Mill building, which climbs up the mountain overlooking The Gemstone Mine. This fanciful building was inspired by the historic mill building that stood right across the road in early days, of which there is now no trace. Discovery Mill encompasses 10 different floor levels of shops and exhibits and covers a wide variety of themes and collections. 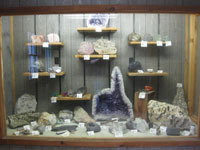 All the displays are free to the public, so allow a little time (and energy) to explore all the different rooms. As you climb the stairs each level offers a different vantage point to enjoy the impressive view looking into the Big Deal Mine. The first floor houses the Crabtree Junction Shop, with information, clean restrooms, a variety of souvenirs and gifts, and the Deli. The Deli offers snacks, chips, drinks, coffee, popcorn and ice cream. There’s an indoor picnic area available right up the stairs or you can use any of our outside picnic facilities. The Antique Music Museum – awesome collection of organs, music boxes & more. 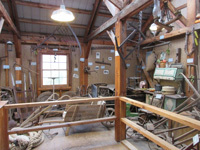 The Museum Annex - more good old junk than you can imagine! The Discovery Mill Building adds new levels of adventure and exploration to your Emerald Village experience. It’s fun to discover Discovery Mill! Wheelchair/Stroller Access Note: The slide show, Gemstone Mine, gift shops, restrooms & picnic areas are all partially accessible to wheelchairs and strollers. 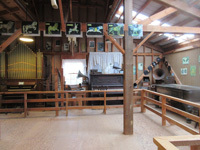 Because of stairs, the underground mine tour, the Black Light Mine Tour, and the Discovery Mill Building displays are not wheelchair/stroller accessible.